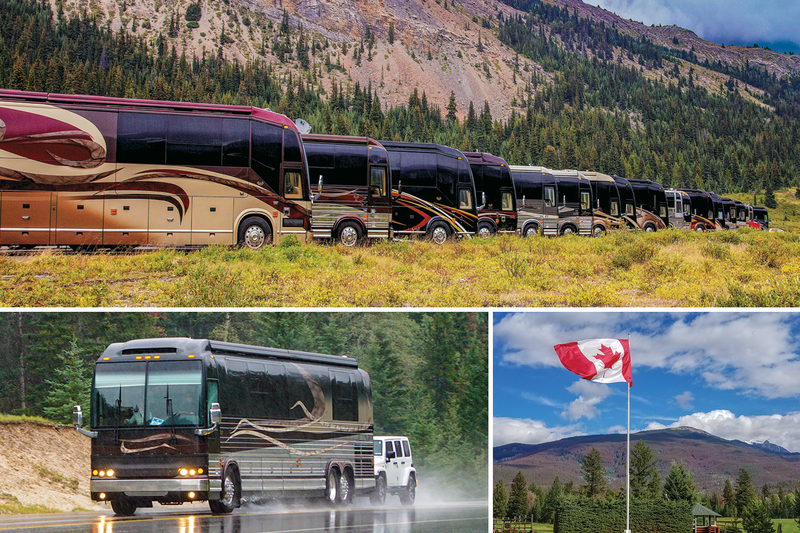 The “Canadian Splendor — Banff to Jasper” Rolling Rally began with 42 luxury motorcoaches weaving their way on scenic roads through the rugged Canadian Rockies and spilling out into picturesque Banff, Alberta. Filled with postcard-perfect views, Canadian grandeur and interesting friends both old and new, this rolling rally was anything but ordinary. The late summer adventure, August 21-29, 2018, began at Canada’s first national park, Banff National Park. Established in 1885, it continues to attract visitors from every corner of the globe, and rightly so. The natural beauty of the Canadian Rockies is only outshined by the hospitality of its people. No photo can truly capture the splendor of the mountains, canyons, turquoise lakes and abundant wildlife that’s here. Rally festivities officially commenced Tuesday evening at Banff’s Juniper Bistro. Marathon Club Board members, First-Timers and their Rally Buddies arrived early to get acquainted with each other and take in the expansive views of three nearby mountains and Vermilion Lakes, as well as indulge in handcrafted cocktails and tasty passed appetizers. After the remaining attendees arrived, the patio was buzzing with old friends reconnecting and new introductions being made. With the entire restaurant reserved for the attendees, dinner was served within the wall-to-wall glass windows overlooking breathtaking vistas. 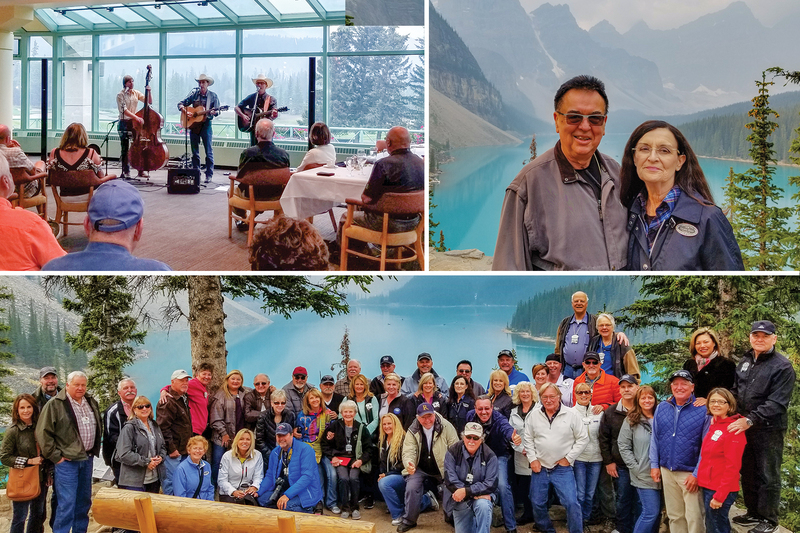 Wednesday morning’s activities included a bus tour of Banff, a visit to Cave and Basin National Historic Site and a gondola ride to the summit of Sulphur Mountain. The subsequent private lunch at 7,510 feet made for a memorable meal at the Sky Bistro, which featured the distinctive flavors of Canada. After returning to the campground for a little rest and relaxation, it was time for an exceptional, five-course private plated dinner in town at The Bison. Considered one of the 10 best restaurants worth travelling the world for according to the “Ottawa Citizen,” this farm-to-table restaurant sources locally, so much so that they have a regional map showcasing their many suppliers. 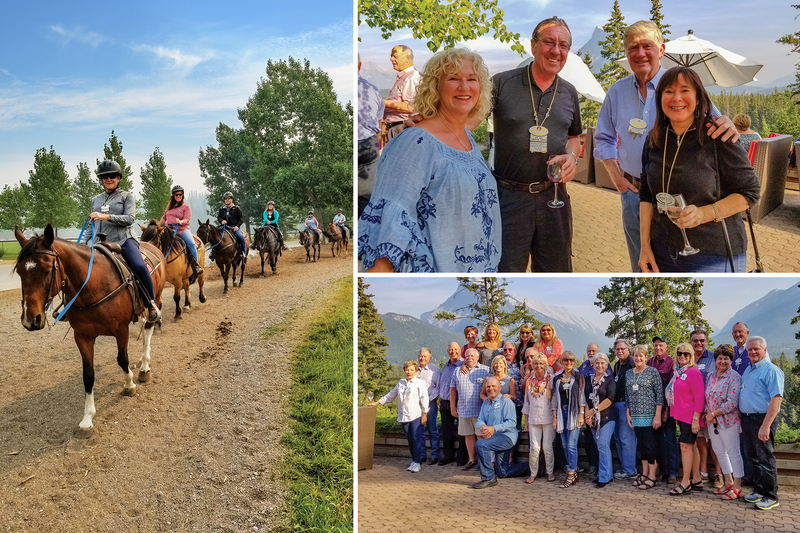 Thursday presented the opportunity for active adventure — horseback riding or river rafting — while the evening brought a relaxing pace filled with good food at Stanley’s Smokehouse and live music by The Wardens, who played the perfect blend of folk, root and western styles. With haunting three-part harmonies and chilling tales, the music of these three men rises from land they protected when they were rangers in the Rocky Mountain national parks. On Friday morning, the traveling troop of attendees packed up, left Banff and relocated to Lake Louise Trailer Court for two nights. The evening was a night of classic celebration at a private gala at Fairmont Chateau Lake Louise. With the feel of an exclusive club, this facility exuded both charm and opulence, much like rally attendees in their party finery. Passed hors d’oeuvres, free flowing libations and dinner in the genteel, classically designed Victoria Ballroom made for a marvelous evening as the music of the Bel Canto Trio wafted through the air. The next morning, the group was off to Moraine Lake in the Valley of the Ten Peaks. At 6,183 feet, this glacially fed lake has a stunning, distinctive blue color. Lunch at The Station restaurant in Lake Louise rounded out the day, providing everyone a free afternoon and evening. With a private bus on call at the park, attendees were able to skip the long lines of people waiting for the public shuttle buses, and make their way quickly to Chateau Lake Louise. With one end anchored by the Victoria Glacier and the other by the Chateau, the vivid aquamarine lake was the perfect place to canoe, lounge or simply contemplate life. The rally caravan set out Sunday morning, spanning from Banff to Jasper, with stunning scenery accentuated by ancient glaciers, cascading waterfalls, wildlife and sparkling turquoise lakes. With a scheduled stop at the Columbia Icefields, Marathon after Marathon pulled into the upper parking area, with some spilling into another lot below. Soon everyone was shuttled off to board a massive “Ice Explorer” vehicle to embark on a one-of-a-kind icefield adventure. Freezing rain and excitement filled the air as attendees walked on the Athabasca Glacier, filled bottles with right-off-the-glacier water and took sensational selfies. Of course, no visit to the icefields is complete without a trip to the nearby Glacier Skywalk. Soon thereafter everyone was back in their coach and headed north to Whistler Campground in Jasper National Park. Tuesday was the highly anticipated Maligne Valley Wildlife & Waterfalls Tour with Maligne Adventures. Although the trails were humming with people, the waterfalls, slot canyons and wildlife didn’t disappoint. After a substantial lunch at Maligne Lake Lodge, it was on to the panoramic boat ride to Spirit Island. After hiking and taking photos on shore, it was time to return to the mainland to get ready for the rally’s final night, dinner and dancing at Jasper Park Lodge’s Beauvert Ballroom. After enjoying savory appetizers and a wonderful meal, couples and friends alike got to their feet to dance as a talented group from Canmore, “One Nite Band,” performed, belting out familiar songs throughout the evening. And just like that, this Marathon family vacation to the capital of natural splendor became a beautiful memory. The following morning, one by one, attendees packed up their coaches and headed out for their next adventure.